Wedding and couple photography, especially candid forms of it, are steadily picking steam these days. What is considered worthy of keeping as memory these days, is a bunch of photos shot well, that not only capture the event as it happens, but also the way it happens. We’re bringing you 13 candid wedding photographers from Delhi who will make sure your wedding pictures are not only nice and pretty, but also interesting, meaningful, and memorable. Whether it's portraits, a family shot, or a photo documenting of the biggest day of your life, these guys successfully capture the most real, meaningful moments, either through a montage or a photo-book. Their pictures are unique in terms of colours and rustic tones, with an everlasting touch. Their style is a mix of photojournalism and glamour photography, covering everything from the makeup, family drama, and hidden glances between the couple. A visual treat of colour and composition is what Ramit is known well for. The eye and attention for detail (as well as the pop of happy colours in his pictures) stand out, making it a memorable experience. Tarun is known for capturing that perfect moment for you in his frame. His favourite subjects are women, especially when they’re getting ready for the most important moment of their lives. He can click them in a thousand ways and still not run out of new ideas. Arjun and Praerna Kartha lead a couple-driven wedding photography boutique. With a penchant for fun photos, they create behind-the-scenes memories that will last a lifetime. They perfectly understand the hard work that goes behind making a wedding ceremony happen, and are able to seamlessly blend in the day-to-day celebrations to capture what many others are never able to. Mahima has a keen eye for detail and attention, which helps make her brides look extremely radiant and beautiful. While she covers everything at the weddings, she specialises in the bride’s pre and post shots (as well as general pre-wedding shoots). He is among the most sought-after wedding photographers in the city. His work speaks for itself; Be it the shots capturing the giggling, the bickering or the shy smiles, he thinks each picture has a story to tell. More than a photographer, he believes he is a storyteller and firmly believes that the bride and groom are the leading characters in his stories. 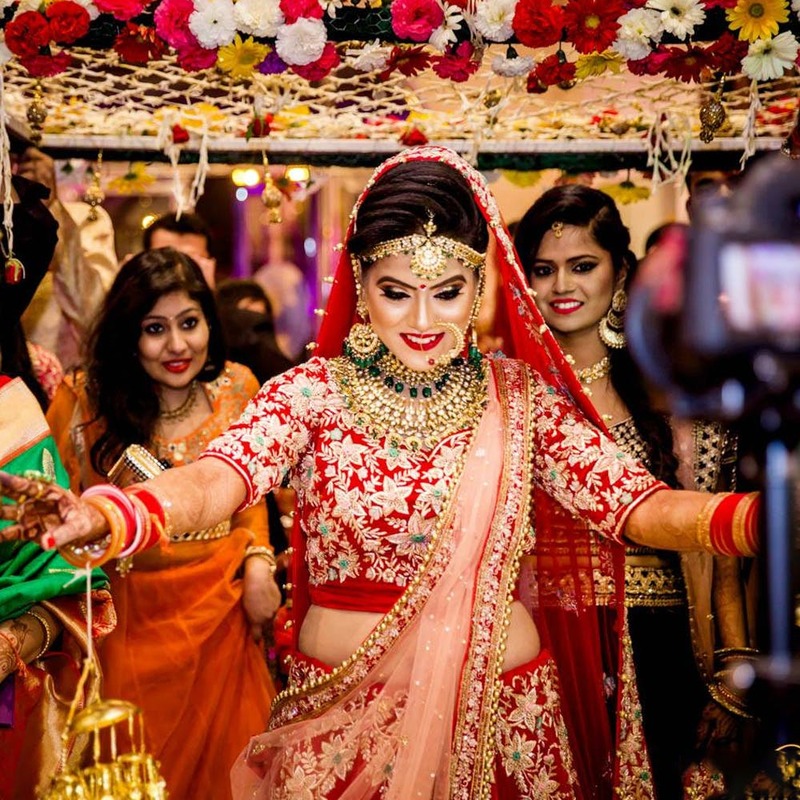 Started by friends who met at NIFT while studying, Delhi Wedding Filmers specialise in photography and cinematography. Because of their creative training and years of working within the industry, they can capture your intimate moments beautifully. They capture you right in the middle of all the celebrations to convey all natural emotions. The team at Vogueshaire knows how important the moments at a wedding are and they do a very good job with capturing it all. If you have them on board, be assured that they will capture everything that goes behind a big fat Indian shaadi; From the goofy stuff to the emotional memories, you’ll find it all in the photographs they click for you. Time Shutterz have a team that has travelled within Indian and has also gone overseas to capture the special moments at weddings. Because of their vast experience, they know exactly what they’re doing. If you’re looking for a team that can capture the whole journey of your wedding frame by frame, call these people right away. Every wedding has a story of how it all started, doesn’t it? The team at Pakhi Weddings aims at telling the story of your wedding through their lens. They want capture you and your significant other during the most memorable moments. It could be you two teasing each other over something or the joyous feeling on your faces during the wedding ceremony, they’ll cover it all for you. Started in 2015, Fotowalle have gained a lot of popularity because of candid shots that burst with colour, capture true emotions and give you memories you can freeze in time thanks to the technology they use. They have a very keen eye for beautiful backdrops that add to the photos. The promise they make is that you’re going to relive all your wedding memories once they send across the album to you. This recommendation was first posted on Breviloquent.